Stamkos, Subban, Weber, Ovechkin, EKBLAD are just of a few of the NHlers that can turn a quick pass into a goal using the one-timer. The element of surprise and the angle-change on the goalie are the ingredients but how can ensure you’ll get a good shot off? The keys to an effective one timer are accuracy and a quick release and both depend on getting regular reps in your training routine. 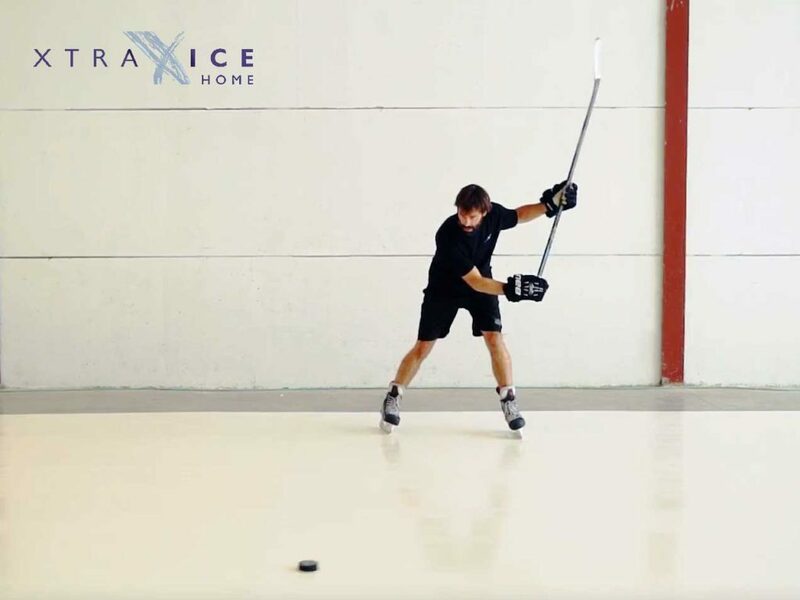 With on-ice time limited it can be difficult to work on mechanics instead of just taking a few hard shots when you get a chance and that’s why working on technique at home can pay big dividends in just a short amount of time. In the video posted above, Trevor Lindros demonstrates these simple drills on an Xtraice Home synthetic ice surface but you can use these drills wherever you normally practice. Keep in mind that being on skates is key. This drill is meant as a technique warm up to make sure that your shooting form allows you to accurately hit each corner and the 5 hole. Take your time and focus on the feel of the shot. In game situations the passing angles will change quite a bit. In the video above you can see how Trevor takes passes from a 90-degree (or perpendicular) angle but then adds passes from lesser and greater angles. He then goes on to take shots from down low and on the off-wing, where the one timer becomes more of a quick deflection, intended to get the puck on net as quickly as possible. Practicing these will make you more comfortable in game situations where you’ll have to adapt to where you are on the ice. Now let’s be realistic. It’s rare to get perfect passes, especially in tense, game situations, so practicing your one-timer off difficult passes is an invaluable tool. The key here is to adjust to the pass without changing your technique. Adapting your footwork and using a shorter shot, like a half-slapshot are great ways to do this. Remember, technique is what will make your release quick and your shot accurate, which translates into a higher scoring percentage. Don’t chase a harder shot by changing your technique. Good luck and enjoy practicing!